The San Francisco Bay Conservation and Development Commission (BCDC) has partnered with the National Oceanic and Atmospheric Administration Coastal Services Center to work with San Francisco Bay Area shoreline communities on planning for sea level rise (SLR) and other climate change–related impacts. The overall goal of the project, called Adapting to Rising Tides (ART), is to increase the preparedness and resilience of Bay Area communities to SLR and other climate change–related impacts while protecting ecosystem and community services. 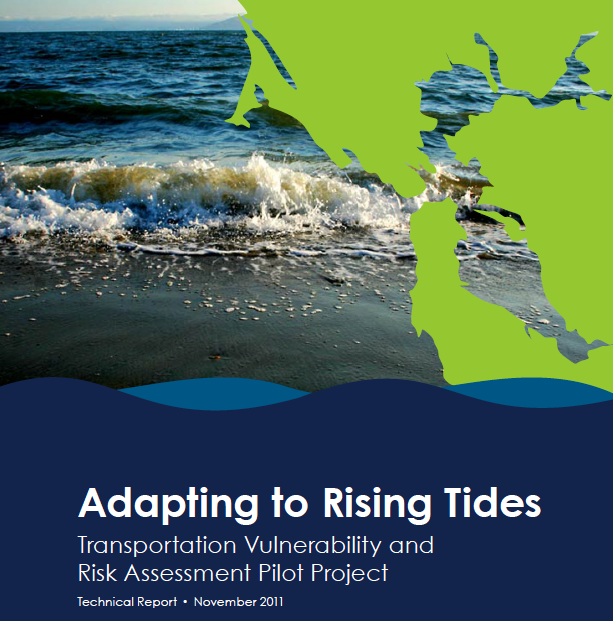 It involves evaluating potential shoreline impacts, vulnerabilities, and risks; identifying effective adaptation strategies; and developing and refining adaptation planning tools and resources that will be useful to communities throughout the Bay Area. As part of the project, the Metropolitan Transportation Commission (MTC), California Department of Transportation District 4 (Caltrans), and BCDC collaborated on a subregional planning pilot project to test the conceptual Risk Assessment model developed by the Federal Highway Administration (FHWA) to assess the climate change–related SLR risks to transportation infrastructure in a select portion of the San Francisco Bay Area. The purpose of the pilot project is to enable the region’s transportation planners, including those at the MTC, Caltrans, congestion management agencies, and local governments, to improve vulnerability and risk assessment practices and to help craft effective adaptation strategies. If both existing and planned transportation infrastructure is assessed, vital infrastructure can be protected, and future investments can be guided by the best available information about future climate and SLR conditions.